Abigail Levine: Would you introduce W.A.G.E. and its history briefly? Lise Soskolne: W.A.G.E. was founded in 2008 by a group of visual and performing artists, and independent curators, many of whom had amassed a noticeable amount of cultural and social capital but had no money and wondered why they were always broke. There were email exchanges, meetings at apartments and studios, and discussion around the issue of nonpayment. Two public meetings at Judson Church followed; the first was attended by maybe 50 or 80 people, and the second was about the same, maybe slightly smaller. At the first public meeting the question of whether nonprofits actually pay artist fees was introduced and nobody could say for certain if they did or did not, or whether they were mandated to or not. At the second meeting we broke out into working groups and these winnowed down over time into a core group of organizers. The first two years were spent doing consciousness-raising as well as developing the 2010 Artist Survey, W.A.G.E.’s first major initiative. AL: At that point did certain goals coalesce? LS: 2010 was a pivotal year; in addition to the survey it included W.A.G.E. 's first certification. We certified the New Museum exhibition “Free”, curated by Lauren Cornell. AL: What are the survey and certification? LS: The survey collected data about the economic experiences of artists working with nonprofits in the 5 boroughs between 2005-2010. It asked very basic questions like, did you work with a nonprofit during that time? If so, did you receive a fee? If you received a fee, how much was it? Were your expenses covered? If so, which ones? The same kinds of basic questions W.A.G.E. has been asking for a while. AL: By nonprofit you mean, a visual art, presenting organization? LS: Yes, although at that point it wasn’t as clearly defined as it is now. The survey was split into two parts, one for small to medium-sized organizations and the other for large organizations and museums. There are operational differences between the two and there were too many organizations to list in a single survey so we somewhat subjectively determined which fit into which category, but you could fill out both surveys. AL: This excluded commercial galleries? LS: Yes. And nonprofit means a 501c3 charitable organization. In terms of the New Museum certification in 2010, that was for a single exhibition. W.A.G.E. had been invited to participate in the exhibition “Free” as an artist but because W.A.G.E. is not an artist, and the work that we do is not art, we instead chose to negotiate fees for the participating artists in the show. This was an important decision both because it marked the introduction of W.A.G.E. Certification as a strategy for regulating compensation and because it defined the nature of our work relative to what we wanted it to accomplish, namely: the payment of artist fees by nonprofit art institutions. From there it took about a year to clarify that certification would likely become W.A.G.E.’s primary initiative. At that point we decided that it would no longer be for individual exhibitions but would, instead, be for entire institutions because we believe that an institution must show a long-term commitment to paying artists equitably and to paying fees, and compensation for a single exhibitions isn't enough to indicate that. AL: There's an assumption, I think, outside of the art world that professional visual artists make their living through the sale of their work, but W.A.G.E. was saying that, regardless of this potential, artists need to be compensated for their work presenting their work. Is that right? LS: Yes, but it took some time to define what that meant—to identify and articulate precisely what aspects of presenting one's work compensation was intended to be for. Certification was initiated in 2010 but was developed into a policy and regulatory tool between 2011 and 2014. We now define the artist fee as: compensation for the work that you do once you enter into a transactional relationship with an arts organization. 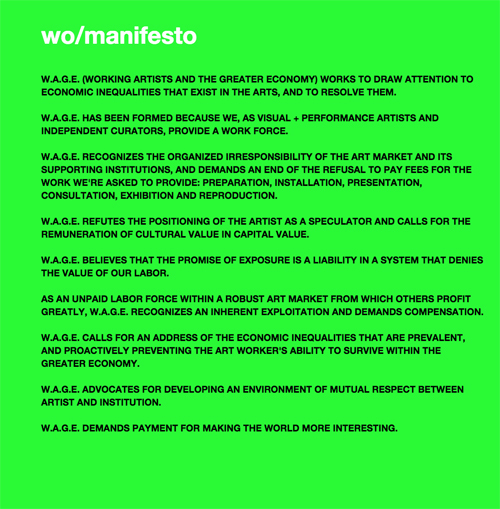 Referring back to W.A.G.E.’s 2008 wo/manifesto, that work might include preparation, installation, presentation, consultation, exhibition and reproduction, among other things. Essentially it’s inclusive of the work that you do to mount a program or exhibition in coordination with an arts organization, and is exclusive of the labor you might expend prior to that relationship, such as time spent in the studio, in reading groups, or doing research, etc, since there is no way to demarcate when that kind of work begins and ends, or to quantify its value in monetary terms, unless it’s as waged labor, but even then it’s incredibly difficult to price. Under W.A.G.E. Certification, you’re not being compensated for being an artist, you’re getting paid for the work that you do when you work with an institution. AL: So it’s much more circumscribed and it’s meant to move towards compensating this very quantifiable labor in some fair way, which may or may not make it feasible for you to continue to survive as an artist? LS: Yes, it’s an effort to bring definition and hyper-clarity to something that has been hyper-nebulous for a long time. Being a fee and not a wage, this kind of compensation still remains symbolic of "actual" value but the language we’ve developed around it is intended to open the door or shift the paradigm toward thinking about artwork as labor, or artistic engagement with institutions as being labor, and to assign a price to it that reflects what the labor is worth. But because the way artists make work and engage with institutions has and is changing so rapidly—from something like a sustained and fairly autonomous studio practice from which the work is placed in an exhibition context, to the kind of post-studio production in which the work is made on a commissioned basis—the work of making art tends to be more prescribed and much of it happens once an artist gets a show, or as we might put it, once an artist is subcontracted to produce content or provide services for an arts organization. That’s the moment you enter into a transactional relationship. Anecdotally speaking, it seems more unusual these days for a curator to go to an artist’s studio and say, “I want to show that body of work.” When an institution invites an artist to work with them that tends to be when the work gets made. Institutions want new work, and more often than not it incorporates some kinds of institutional critique, even if it’s just a nod to the context and conditions within which it’s being produced exhibited—and this would necessarily take place once an artist has begun working with that institutional context. When I try to describe what the fee is compensation for, I sometimes picture it like this: you’re at home or in the studio on the computer or phone, and at the other end—as in the child’s mock telephone line made of two tin cans and a piece of string—is the curator or administrator, at their desk in the institution. Their work mirrors many of the tasks you’re doing to produce the exhibition or program but they’re getting paid a salary and you’re not getting paid anything . I wish I could say that our fee schedule represented some kind of living wage standard but at this point it remains symbolic. At the 2014 W.A.G.E. Summit, where W.A.G.E. Certification was formalized into a policy, this issue was debated during a session called “Living Wage or Symbolic Fee”. We decided by consensus not to align the program with a living wage campaign for several reasons, one being that no organization would be able to afford to pay fees at that level, which would kill the project. Minimum wage campaigns are more tenable and have higher success rates because wages are lower and are thus more achievable. Essentially, the tension during the development of Certification has been between what is fair and what is possible. It might be more fair to advocate for a living wage but given the funding limitations in the nonprofit sector, achieving one wouldn’t be possible. AL: What does it take for an institution to be certified? The first and most basic requirement is that “Artist Fees” must be its own separate and distinct line item in operating and exhibition budgets. That literally enables us to assess if organizations are paying fees that meet our requirements in one of three different tiers. If their operating expenses are below $500,000, fees must be no less than the specified minimum or “compensation floor”, which we call “Floor W.A.G.E.”. The second tier, which we call “Minimum W.A.G.E.”, is for organizations with operating expenses above $500,000. In this tier the fee is tied to the organization’s projected total annual operating expenses and scales up in direct relation to them. So the higher their expenses, the higher the fee. Required fees are calibrated precisely for each institution so I make a customized fee schedule based on their projected budget using the equation of our fee calculator. AL: And then above a certain amount and it tops out? LS: Yes, at 15 million. The scale-up continues up to 15 million, but above that it is recommended and not required; at 15 million, there is a fee cap to ensure that nobody profits from the redistribution of wealth, including artists. We also require that the institution cover what we call basic programming costs and services. These constitute the baseline infrastructural requirements that an artist can expect an institution to provide, and these costs cannot be taken out of the fee. The logic here is that given the current state of precarity, in which workers are often expected to supply the workplace infrastructure, we assert that in the visual arts the opposite is true. The institution is the infrastructure that cannot be provided by the artist. This includes the provision and preparation of exhibition, performance, or projection space, the coverage of shipping and insurance costs when necessary, presentation infrastructure, including display equipment, exhibition furniture and lighting, documentation of the exhibition or event, promotion, travel and accommodation when necessary, and obtaining and paying for image rights for commissioned and existing texts. AL: And there was also a discussion of the costs of production, yes? LS: We decided not to make the coverage of production costs a requirement of certification because we didn't feel it was fair to penalize smaller institutions who potentially can’t afford to cover these expenses. In a performance context it seems more necessary, but there are some aspects of performance under certification that are unresolved, actually. AL: Yes, because the wages of performers, or subcontracted performers in the language W.A.G.E. uses, could be seen both as artist wages and as productions costs. Was performance part of W.A.G.E. 's conversation from the beginning? LS: Yes, W.A.G.E. was founded in part by performing artists. The original tagline read, "W.A.G.E. is a group of visual and performing artists, and independent curators." It was very distinctly part of what W.A.G.E. was organized around so there was never any question that performance would be a consideration. This became clearer in designing the survey because it consciously included a category for performance. But given the constraints of the online survey format we used, it was logistically challenging to include different questions about the exhibition conditions for performance, but it became clear that different questions needed to be asked, particularly related to what expenses were being covered. That’s probably when we started to think about production costs as being different for performance than for other kinds of exhibition or installation work. The survey was in development around the same time that Performa began, which you could point to as a marker of when performance became a consumable form within the visual arts, or as you put it, an emerging form in terms of its prominence and wider appeal. A biennial exclusively for performance says as much. AL: Then, when I came into the conversation, you had been talking about this idea of hired performer labor? Or was that later? LS: Do you mean dancers? I don't think we had gotten that far yet. I think that came specifically from you and your experience. That was definitely what got me thinking about it. AL: Right, when I got to know W.A.G.E. 's work, it seemed logical to include some sort of fee schedule for performers within the W.A.G.E. calculator. And, again, the tricky part was the balance between what would be fair compensation and what a smaller institution, or an individual artist, could afford. My experience was with large museums, and the principle seemed clear that, if performers were working in an institution of that size, they should be compensated at a level commensurate with their work in major performing arts institutions—theaters and opera houses. The first stumbling block was that there was no precedent for this kind of compensation and, so, the logic of the fee structure for freelance performers made little sense to the institutions. Then, there was the problem of how to scale down for smaller institutions. This became clear in our discussion with Lumi Tan from the Kitchen, that the way that they structure fees for artists in either their gallery or theater would not enable them to guarantee a day rate to performers. As conversations continued, I felt that inclusion of performers and performance in a W.A.G.E. structure still should fall under the notion of visual art presentations because the economy of producing a dance or theater-based show has a whole system of considerations that this fee structure doesn't answer. LS: Yes, and now that we’ve launched the program and it’s operating, it’s clear that our inclusion of performance and performers has to be strictly limited to a visual arts presenting context, and for us to be able to certify dance or theater-based programs, we have to develop a fee structure for a performing arts presenting context, which we are starting to work on together. The other issues we discovered in conversation with Lumi are the cost of paying people for rehearsal time and covering production costs because they tend to be high in a theatrical context, and unlike the production of capital-intensive material artworks, production costs cannot be recouped through sales and are generally not subsidized by commercial galleries. AL: I also think it's important when people look at the fee schedule they remember that the proposed fees are a minimum rather than the goal. As with the artist fees that are meant to both provide a step towards a living wage and spur conversation and negotiation, I don't think people should look at the performer fees and think that they are meant to represent a living wage. We had this discussion about these museums essentially that their budgets are so high that the calculus of the $5 million budgets and above doesn't any longer work. I think the numbers work so that you get up there and for a performer its about $200 a day, which would obviously be more than symbolic. LS: Even after $500,000, its $20 per hour or a $100 day rate, whichever is higher and while $100 for an 8-hour day ($12.50/hour) is closer to minimum wage, it’s probably closer to resembling a living wage than the other fees, given the amount of production time that cannot and is not being accounted for. AL: In these questions of situating artists in relation to different economies, were there any discussion or thinking about this organizing effort in relation to either other labor movements or other communities? LS: Do you mean at the beginning? AL: Anywhere throughout this process. LS: Occupy Wall Street brought W.A.G.E. 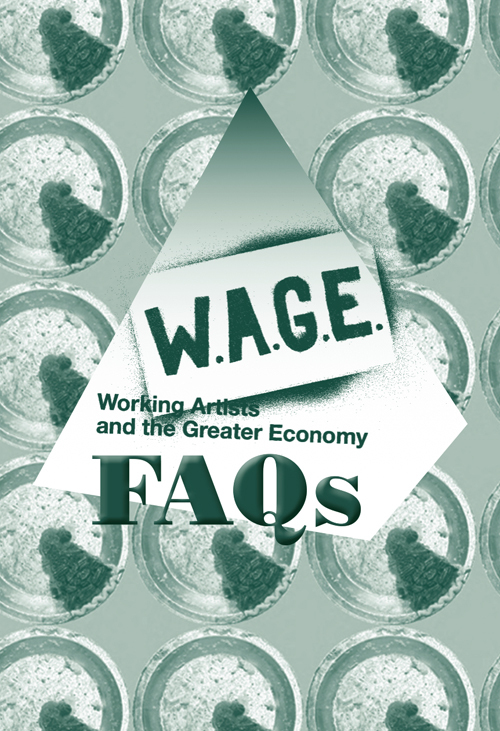 into close proximity with other organizing initiatives both in and outside of the art field, and W.A.G.E. began to shift around that time, in part because of that. On a strategic level, it’s important to align the labor of artists with other kinds of labor to make the point that art is not exceptional: it is precisely its claim to exceptionality that causes artists to not get paid, and this claim gets made by both by artists and institutions. If we identify artistic labor as being no different than any other form of subcontracted labor, laying claim to compensation becomes inevitable, while also positioning artists squarely within the ever-expanding contemporary precariat, which the exploitable nature of artistic labor was pivotal in defining. The willingness of artists to work for free, justified by the “labor of love” argument, the satisfaction of being “creative” logic, and the promise of exposure, finds application in many other industries, most notably among the so-called creative class. We are all being exploited by a similar logic, and it’s in the strategic interests of artists, not to mention in their ethical interests, to align ourselves and fight together with others in the same position. The UK’s amazing Precarious Workers Brigade does exactly that. AL: I think people are starting to think, in regard to issues like gentrification, that it's shortsighted to think of artists fighting alone, saying "hey wait, don't raise the rents on the neighborhood" rather than forming more multi-class and multi-cultural coalitions. LS: Yes, agreed. If artists don’t start building coalitions across class, then the divide will continue to widen and artists will find themselves having to pick which side of it they’re on—and given the increasing scarcity of resources, they’re likely to pick the side that guarantees their own material survival. I’m personally fascinated by, and critical of, artists’ ability to straddle and lay claim to more than one class position at the same time. Despite the fact that many artists today function more like entrepreneurs who, when their commercial success demands increased supply, run their own mini factories and liaise with the elite who consume their work, they continue to identify with and as working class—which might be appropriate to the extent that their labor is being exploited and they tangibly experience material precarity. But because only those who can afford to work for free can afford to enter the field, being an artist today inherently implies a more elite class position. When artists identify as workers under conditions that stand to benefit their careers and not a broader class struggle, then such an identification is likely more aesthetic than political. Of course not all artists lay claim to different class positions depending on what the context requires, but those that do play a dangerous game, and so any kind of attempt at coalition building across class has to bear in mind that artists are often regarded with mistrust in that sense. A text I wrote called “On Merit” for the Artist as Debtor conference in New York this past winter includes some discussion of what it means for artists to embody these kinds of contradictions. AL: Introduce a little of your thesis of what you presented. LS:The text connects the contradictions inherent to being an artist under neoliberal capitalism to the contradictions inherent to the nonprofit economy, and tries to show how these contradictions are determined and maintained by the deeply flawed philanthropic tradition that supports it. It poses and answers the question why don’t nonprofits pay artist fees? by looking at how money is dispensed within the field by private foundations to nonprofits, and by nonprofits to artists on the basis of charity and merit. I discuss how this convention is a means of placing the nonprofit sector in service of maintaining the status quo in the for-profit sector. So, starting at the ‘top’, think about how philanthropists, who accrue wealth by exploiting labor, appear to ever so generously use their wealth to fix what they identify as “the root causes of social problems” through their giving priorities, and how nonprofits are forced to appeal to foundations on that basis in order to survive. Nonprofits have to prove that the work they do merits the charity of the funder – a very similar dynamic that artists find themselves in relative to nonprofits in the logic they’ve tended to use in dispensing artist fees (as charity and on merit). In terms of philanthropy, not only does the assertion of fixing social problems at their root cause imply a great deal of hubris, it exposes the great irony on which the entire system is based: philanthropists receive profound tax breaks and are incentivized by tax law to solve so-called “social problems” but it is precisely these philanthropists who perpetuate them through their investment in the exploitation of labor and the unequal distribution of the wealth it generates. In other words, philanthropists make money by appearing to solve the problems they helped to create and continue to perpetuate. Given that these logics underpin the nonprofit sector in terms of law and taxation, and also in terms of how labor is devalued, it makes complete sense that charity and merit are the basis on which artists are compensated. The problem is that artists are not charity cases and compensation is not based on merit. It’s complicated and there’s more to it, but as an overview does that make sense? AL: Yeah, it makes unfortunate sense. ...Ok, last question. So in the context of that, I know that you are a practicing artist and you have told me that largely you keep your work private. How does your work with W.A.G.E. and doing this with the economics of art feed your art practice, or vice versa? Does it interrupt it? I think the work I do with and for W.A.G.E., as well as other so-called political work I've done, relieves my art practice from the pressure I might put on it otherwise. I make paintings, and painting, at least from my point of view, has very little or no political agency. In fact, painting is a veritable pariah in the context of so-called political art. The more I tried to make my paintings function as political actors, the worse and more untenable the whole business became. So I prefer to have a dividing line or separation between painting and politics because it’s cleaner and makes more sense to me that way. It also separates how I make art from how I make money, which I also prefer. But that still doesn’t solve the problem of how to be an exhibiting artist. I haven’t found a way to participate as an artist without doing what seems to be required of me, which at this point I seem not willing to do. So for now my work remains relatively private, only to the extent that it isn’t shown publicly. W.A.G.E. serves as a conduit through which I can participate in art, and also acts as a buffer behind which I can continue to make paintings. AL: And you are doing a lot of work to make sure other people can do it in a different way than you choose. LS: Well, I can't say that I do this work only because I want to help others. I derive satisfaction (utility) from it. Like painting, I enjoy it—and I see no contradiction in being compensated for that. 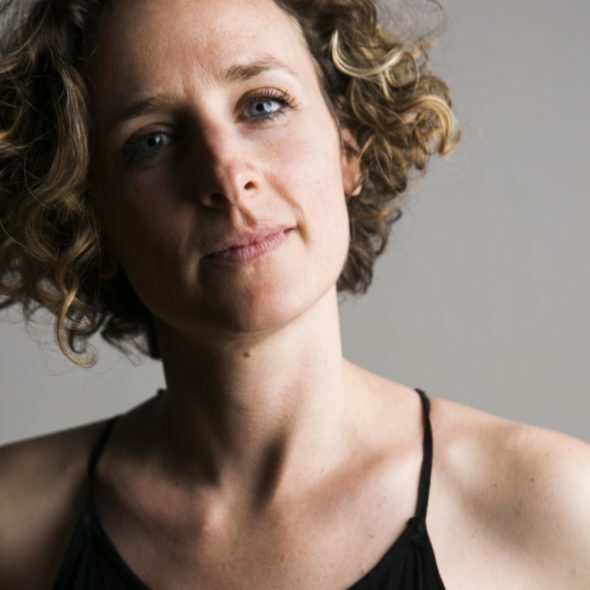 Abigail Levine is a New York-based choreographer and performer. Her works have been shown in the US, Cuba, Venezuela, Mexico, Brazil, Canada and Taiwan, recently at venues including the Movement Research Festival, Dancespace Project, Mount Tremper Arts Festival, Center for Performance Research, Roulette, Gibney Dance, Art in Odd Places, Judson Church, Foro Performática, and SESC São Paulo. Abigail was a reperformer in Marina Abramović’s retrospective at the Museum of Modern Art and has also performed recently with Carolee Schneemann, Clarinda Mac Low, Larissa Velez and Mark Dendy. She holds a degree in English and Dance from Wesleyan University and a Masters in Dance and Performance Studies from NYU. Abigail was a 2013-14 editor of Movement Research’s digital performance journal Critical Correspondence. Keywords: Abigail Levine, Dance and the Museum, Dance and Visual Art, labor, Lise Soskolne, MoMA, New Museum, non-profits, The Kitchen, W.A.G.E.